It’s an old joke, sure. But it’s no laughing matter. Just ask the people of Venezuela. The socialist regime there nationalized the electricity sector a dozen years ago. Today, blackouts in the once-prosperous Latin American nation have become routine. Electricity isn’t all that’s in short supply. Gasoline is scarce in the oil-rich nation, as are food and medicine. Meanwhile, the regime concentrates on violently repressing protests and burning humanitarian aid as it approaches its borders. 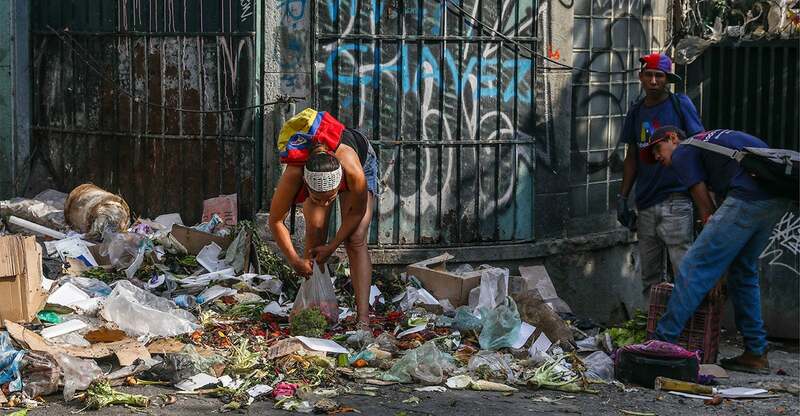 After 20 years of socialism, Venezuela is a failed state. And that should surprise no one. Socialism is a rigid ideology that always ends in tyranny. The prime example is the Soviet Union. Lenin and Stalin’s iron rule brought death to 20-25 million victims. “Enemies of the state” were executed by firing squads, sent to forced labor camps in the Gulag, perished in country-wide forced famines, experimented on in “psychiatric” hospitals, and summarily deported from their homes to the distant steppes of Russia. No less totalitarian in their practices were the Castro brothers, who promised freedom and democracy when they came to power in Cuba. Six decades later, the Cuban people are still waiting for the first free election. Socialism always promises progress, but it inevitably delivers scarcity, corruption, and decay. Eastern Europe under communism became a monument to bureaucratic inefficiency and waste. Throughout the Soviet bloc, life expectancy declined dramatically and infant mortality soared. Upon gaining independence, India trod a socialist path for 40 years. It led to a never-ending cycle of poverty and economic deterioration. Finally, Indian leaders began looking to Adam Smith rather than Karl Marx to guide their economy. Today, it boasts the largest middle class in the free world. Socialism has little regard for the middle class. It’s all about securing and maintaining power for the ruling class. Forty years later, the People’s Republic of China boasts the world’s second-largest economy, but its citizens remain deprived of basic human rights and civil liberties. The Communist Party does not allow a free press or free speech, competitive elections, an independent judiciary, free travel, or a representative parliament. Instead, President Xi Jinping has instituted a cult of personality that rivals the one-time worship of the so-called Great Helmsman, Mao Zedong. Nicaragua’s Marxist leader Daniel Ortega is another example of the lust for power and control that characterizes socialism. His underreported reign of terror has resulted in the deaths of more than 300 dissidents in just the last few years. All of these horrors are inevitable because socialism is built on a fatal conceit. Modern socialists believe that the world has become so complicated, so complex, so globalized, that regular citizens just can’t manage things. We, and only we (say the socialists), are equipped to run things. Hence, for example, it’s imperative to nationalize health care, since “the little people” can’t be trusted to make intelligent, informed decisions about their health care. Rather than empower the common man, socialists believe in empowering bureaucracy. In their minds, bureaucrats will always make decisions based on science and dispassionate reason—and make sure those decisions are implemented and enforced efficiently. It’s an elitist, intellectually arrogant belief, and it’s dangerous. In “The Road to Serfdom,” the Nobel Laureate F. A. Hayek dismissed the utopian dream of “democratic socialism” as “unachievable.” Why? Because it is based on the fatal conceit that a galaxy of bureaucrats can collect, analyze, and direct the individual actions of 300 million Americans. “America will never be a socialist country!” So President Donald Trump declared last month in his rousing State of the Union speech. That should be the fervent prayer of all Americans who prize liberty and wish to live our lives our way.